We stayed in Santa Rosa through Father’s Day and my birthday. We seized the moment and got stuff done like vet’s visits for Miss Madison and eye doc appointments for us. And, as usual, we let the Gladiator run our lives while there. We got some Scandia play time (the local arcade and peewee golf), some Chuck E Cheese time, some beach time, some Redwood Hill Farm petting zoo time, and some Armstrong Redwoods State Park time. The Gladiator and mom checkin’ out the goats. Max and his Oma at the farm. A couple of flowers at the Redwood Hill Farm. Good times at Armstrong Woods State Park. Max hiding inside the tree. Always beware where you put your hands when removing the tire covers! Ouch! As usual, we managed to snub any and all friends and former neighbors on this visit. One thing we noticed is the serious decline in visual beauty of the Sonoma county area. Granted, the state is in serious drought mode, but that should not give excuse to throwing in the towel on even basic roadside maintenance, trash pick up, etc. But you can certainly tell where the money is and how loud it talks…we saw not one dead or dying grapevine, all vineyards being the brightest of bright green. Happy Father’s Day then back on the road again. We wanted to stop in and say hi to Jeanne’s brothers and mother up in Redding, so we travelled to that area and set up for a couple of days at the Winn-River Casino between Redding and Anderson. They have a nice area at the back of the casino/resort that is all paved, FHU’s, and they let you use the pool area which is a really good thing in the summertime. RV sites behind the Winn-River Casino. After a nice visit with the family, it was northbound for us into Oregon and first stop Brookings. We found a beachfront RV park, named, who’d have guessed(? ), Beachfront RV Park, and stayed for 4 days. 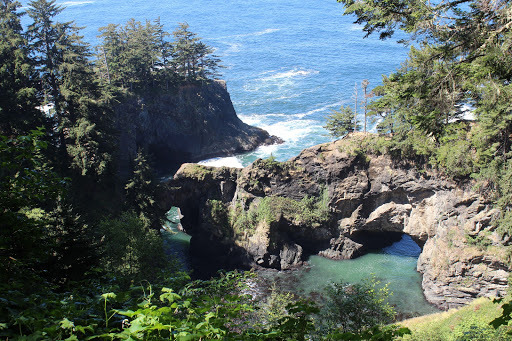 With that as our base, we ventured north and checked out several of the scenic areas along the Samuel H Boardman State Scenic Corridor. The RV park itself was not much to write home about, and a bit overpriced for what it was. The sites were skinny and jammed together, the bath/showers were beat up and run down, and the laundry facilities were needy to say the least. But the scenery in the area was nice even though you are basically in the middle of nowhere, no metropolis towns close enough to explore. 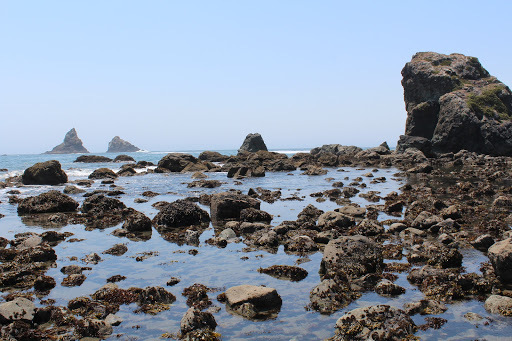 Check out our backyard in Brookings, OR. The beach in front of our RV park. Some of the lovely coastline north of Brookings. One of many arched rocks. 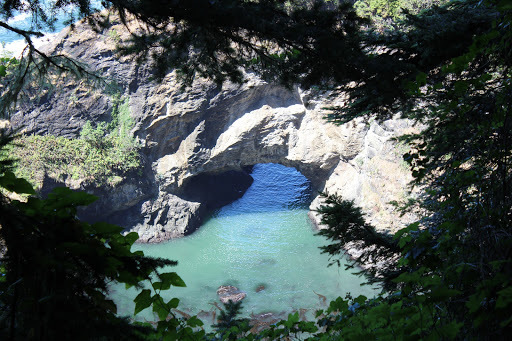 This was a cool natural bridge/arched rocks area in the Samuel H Boardman State Scenic Corridor. 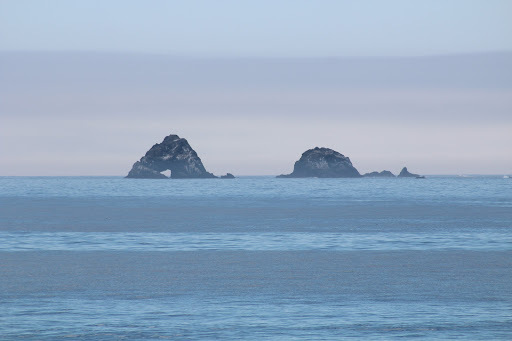 Whaleshead Point, I think it looks like just a rock, myself. Tide pool area at the beach. Next stop, Cape Blanco State Park. The campgrounds there were very nice. The sites were private amid heavy trees and shrubs and they had 50A service and water. Unfortunately at this time, the dump station was closed due to system failure. Good thing we were empty. 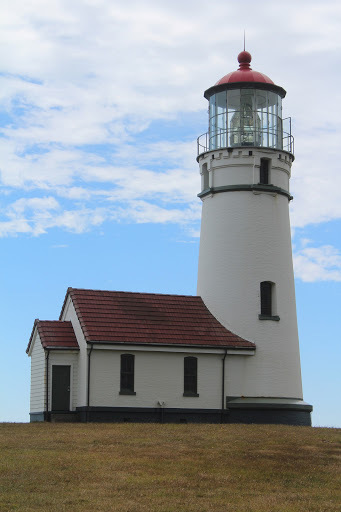 We checked out the Cape Blanco Lighthouse and nearby Port Orford, a small town with not much to it. While we were here, Madison our 11 year old Cocker Spaniel developed a cough with a small amount of blood. We found a veterinarian hospital in Bandon about 30 miles north, so in we went again. We spoke often about wanting to tour the country and see all the Presidential Libraries (we were in Little Rock at Clinton’s, but it was closed at the time, then we were in Dallas near the Bush Library, but the feds decided to close up shop at that very time). But now we half-jokingly tell everyone we are touring all the veterinarian hospitals coast to coast, and that is close to the truth. We had bloodwork and an X-Ray done and the vet put her on some Prednisone and a couple other pills. 2 days later, little Maddie took a turn for the worst, up all night unable to breath well, coughing (no blood), and at 5 in the morning fell off the bed and did not move. We rushed her back to the vet and blood work showed she probably had cancer with an internal bleeder. Maddie was huffing and puffing and by now was whimpering often. We could not bare to see her suffering, so we made the heart-wrenching but humane decision. Little Miss Madison passed away at about 9:30am on July 1, 2015. It was a hard time for all 3 of us…Jeanne, myself, and Woodrow Wilson (Woody, our 6 year old Chihuahua/Terrier). 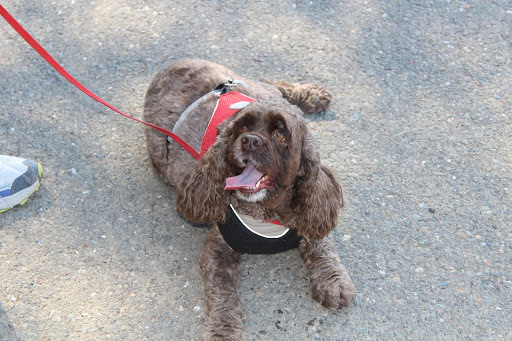 Rest in peace, Madison, we will see you when we get there…and we’ll bring TREATS! 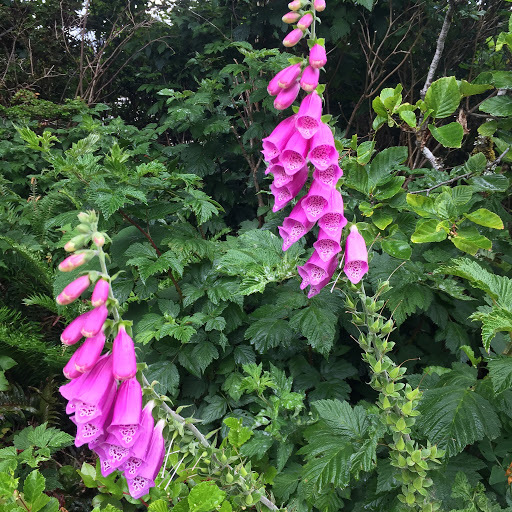 Some of the wildflowers growing inside the Cape Blanco State Park campground. 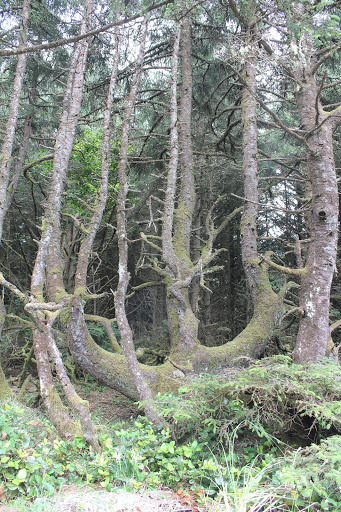 Some of the “wild” trees at the park. 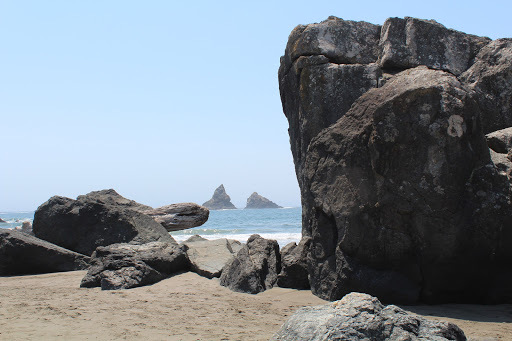 Another arch near Cape Blanco. 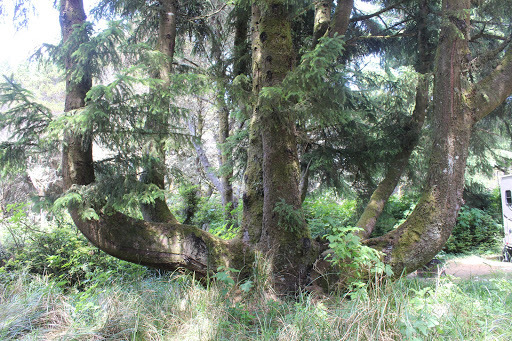 Still another “wild” tree at the campground. 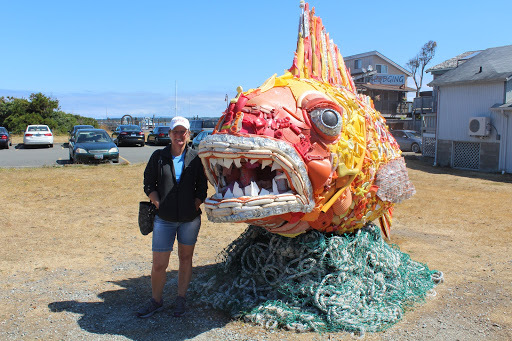 The love of my life posing in front of a large fish sculpture in old town Bandon. The fish made entirely of junk washed up on the beaches. 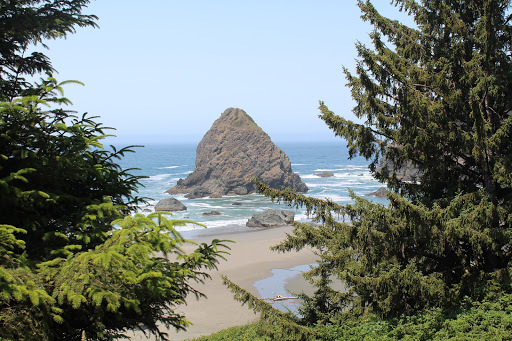 Now being the week leading up to the 4th of July, we found space at the Bandon RV Park for a couple of days, but from here we may try to dry camp at the Mill’s Casino near Coos Bay and North Bend, we’re still not sure. I guess you’ll know when we know, until then…make sure you cherish what you have when you have it, that goes for people, pets, or whatever.